Ramakrishna Mission, Delhi conducted a three day State Level Youth Convention- ‘Awakening the Youth Power‘ from 18 – 20 October 2013. 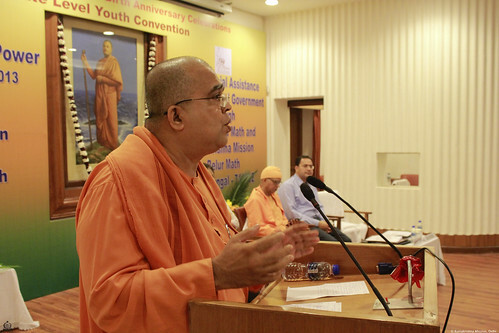 During a session titled ‘Inspired Lives (प्रेरित जीवन)‘ on the third day (20 Oct 2013), Swami Sarvasthanandaji of Sri Ramakrishna Math, Rajkot, spoke on ‘Swami Vivekananda, the fountain-head of inspiration‘. Swami Sarvasthananda is the Adhyaksha of Shri Ramakrishna Ashrama, Rajkot. He joined the Ramakrishna Order at its headquarters at Belur Math in 1987 and served the Mission centres at Limbdi and Porbandar. He has been the editor of the Gujarati Monthly Sri Ramakrishna Jyot for the last 12 years and has been serving in the publication department of the Rajkot Ashrama, which has published more than 200 books in Gujarati and English, during the last 20 years.